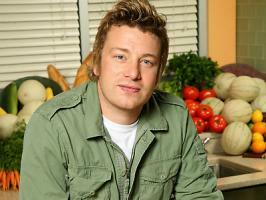 See the gallery for quotes by Jamie Oliver. You can to use those 7 images of quotes as a desktop wallpapers. 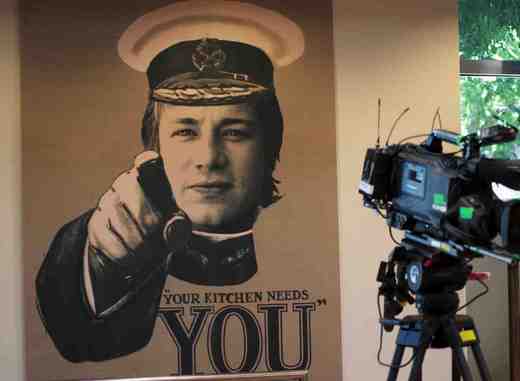 It's just us trying to start a movement where everybody passes on a bit of cooking knowledge. We estimate that one person can potentially affect 180 others very quickly so we're just trying to spread the word. My general rule is that if everyone knew how to cook fresh produce from their local area, and Monday to Thursday within 20 minutes, you know, there's millions of recipes out there to be had. God, why do I give interviews to 'the Guardian'? They always try to dissect you, and I don't really think about stuff in the way that you're asking me these questions. Heads know that failing to invest in good, nutritious food is a false economy and parents won't tolerate reconstituted turkey being put back on the menu. I challenge you, to go to any school and open 50 lunchboxes, and I guarantee you there will be one or two cans of Red Bull, there'll be cold McDonald's and jam sandwiches with several cakes. I love roasting because you can give it love, get it in the oven and go and play with the kids or whatever you've got to do, and then hours later you've got a lovely dinner. I think there are definitely two types of student: the academic kids and the 50% who fail. It's very clear to see - it's fact. We're not doing enough for those who fail; they need a more physical, tactile approach, involving people skills, team-building, problem-solving, building things. I want Americans to enjoy food. I want them to celebrate food. I want them to, on occasions, to have big cakes and great things. And I want them to indulge. I'm better with my hands, and I always loved the slightly romantic idea of starting with bits of wood and being able to create something to sit on, to eat from, to store your clothes in. It's very clear that there's a lot of double standards going on. Should there be a 30mph speed limit? Of course there bloody should. 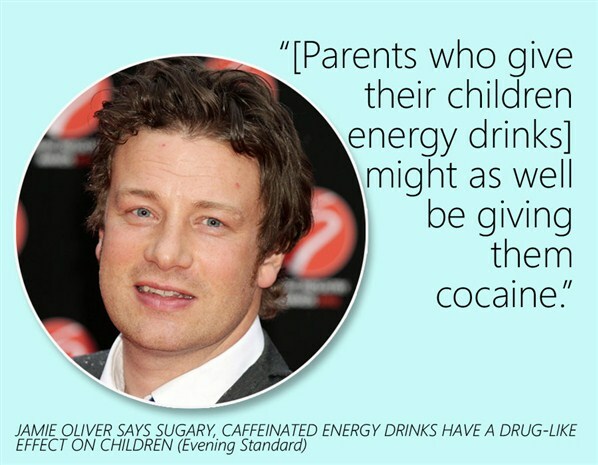 And certainly with kids and school food, kids need to be nannied for sure. 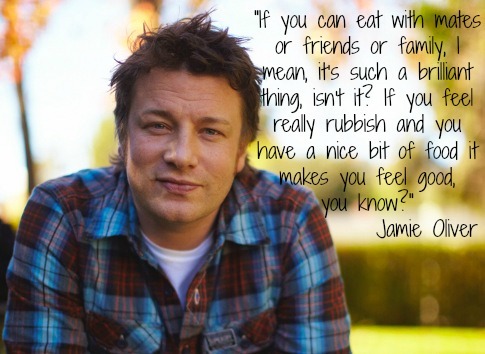 So give them a bloody good meal at school. Like most of the other teachers, I'd done a bit of teaching and we all think we're great at what we do, but you realize that normally you have an audience who are all onside, who all want to listen. What we call barbecuing in this country is actually direct grilling. In many countries, it also means cooking in an enclosed box with a heat source, ideally wood, all year round. Young people can be disruptive and screw up classes. But even if they are being a pain in the arse it's a cry for help - they don't feel like they are being listened to. I'm probably a bit romantic about it, but I think we humans miss having contact with fire. We need it. It's not the extremes and the treats that are the problem. It's the everyday. My aim is to achieve sustainable change, not just make a cute little makeover. 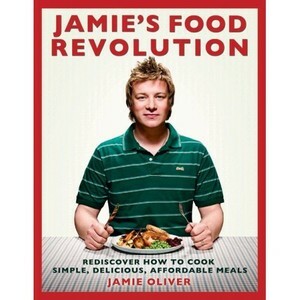 Much more quotes by Jamie Oliver below the page. I could cook from quite an early age - purely because I liked it. I hate making TV documentaries. I left school with basically nothing, I was a special needs kid. I did feel as though my school had let me down. If Obama wanted to make radical changes to America's health long-term, all he has to do is treble the price of sugar and salt. 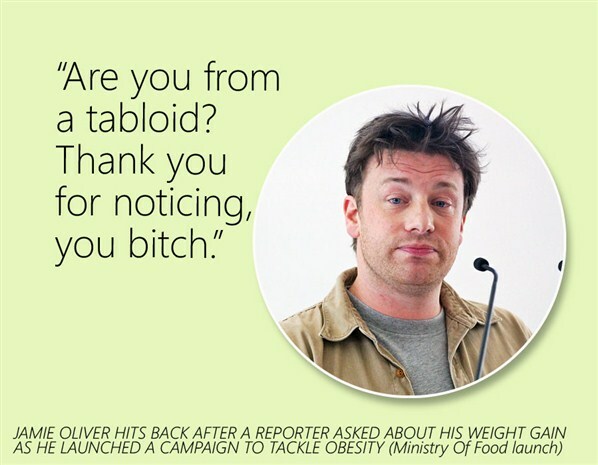 In England, you're allowed to have an opinion - as long as it comes out of your mouth. My life is really so much based in England. We opened a shop in Rotherham which does free demonstrations every day, six days a week and it's been very popular. We're in a situation now where weight and extreme weight and heart disease is the biggest killer in this country today. I wouldn't say that processed food, ready meals and even takeaways aren't relevant to modern life, it's just that over the past 40 years there are three generations of people who have come out of school and gone through their home life without ever being shown how to cook properly. You don't reach points in life at which everything is sorted out for us. I believe in endings that should suggest our stories always continue. Finishing books - and leaving the world you've created - is always a kind of emotionally wrenching experience. I usually cry. I feel a lot of adult fiction looks down on plot as a lesser form of literature. I love to sleep. I'm an excellent, excellent sleeper. I think 'Voldemort' is definitely the scariest villain. I think dystopian futures are also a reflection of current fears. I think I'm able to do so much because writing is what I love to do. So, often when I have free time, I choose to write and edit. I worked in publishing before I became an author, so I knew how a book gets made. My parents were pretty liberal, but they were still parents. I definitely had my teenage rebellion. 'Requiem' has been controversial because people don't feel I gave it closure. With 'Delirium,' I had to spend time thinking about the political, social and religious structure of a different world. But it was a fun challenge. Dystopian novels help people process their fears about what the future might look like; further, they usually show that there is always hope, even in the bleakest future. I often write two books simultaneously. Usually one of them starts out as a fun experiment designed to give me a daily break from the real book I'm writing. And then that becomes a real book too. I try to write characters that are as real, emotionally and psychologically, as I can make them; I feel the same way about setting. This often means that I'm drawing from my experiences and observations. One of the things I've tried to do in my career is really write different kinds of books, so I'm able to broaden people's expectations of what I'm allowed to do. There are times I wish I was more conventional. I would get a husband and a baby and a big SUV in the 'burbs and be happy. But forging my own way - my career, my relationships with wonderful but troubled people - that's who I am.